How do you fit 12.2 inches of tablet into your life? That's a question I'm sure Samsung must have pondered at some point before greenlighting its Galaxy Note Pro 12.2, a device that stretches the upper limits of what we can easily call a tablet. It's also something I've wondered myself, given that its size puts it within uncomfortably close competition with 11- and 13-inch laptops. That increase in screen real estate comes at a high price, too: $750 for a 32GB model and $850 for 64GB, both WiFi-only. 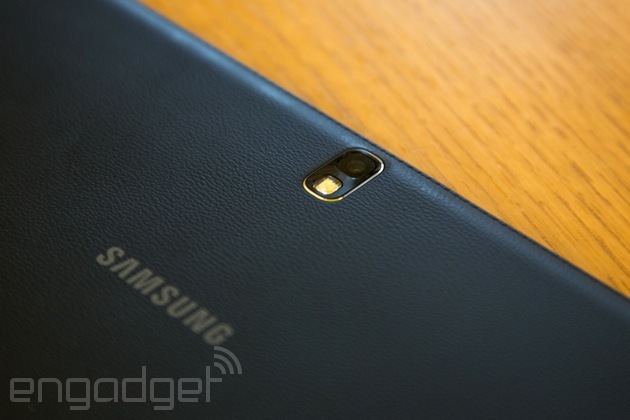 LTE-capable models are coming soon, but Samsung hasn't announced pricing yet. As you might imagine, then, the Note Pro 12.2 isn't intended for your average consumer. No, the Galaxy Note Pro 12.2 is aimed at the prosumer niche of the market -- whoever and whatever that actually means. 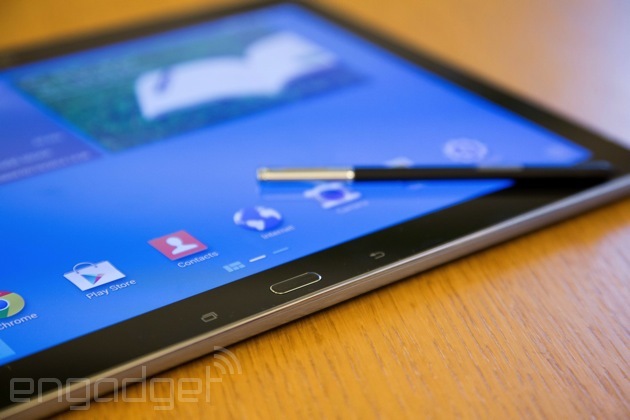 The Galaxy Note Pro 12.2 isn't a complete departure for Samsung, though. 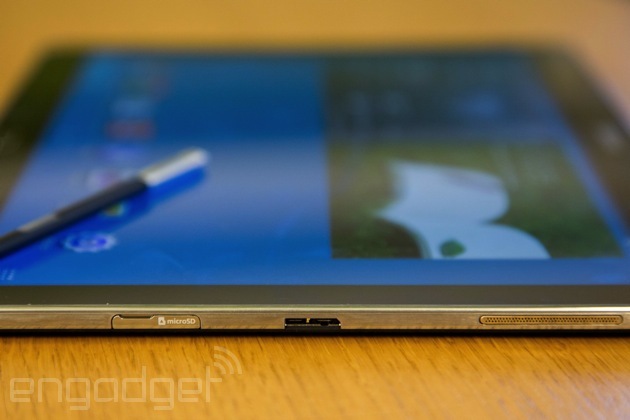 Cosmetically, it's near- identical to the Note 10.1 2014 Edition, except larger. There's that same faux-leather back replete with "stitching," and 2,560 x 1,600 display. What, then, aside from a massive screen, makes the Note Pro 12.2 different enough to justify the price? On paper, the answer to that would center on the version of Android it ships with (4.4.2 KitKat) and its ability to connect remotely to your PC, as well as Samsung's Flipboard-like Magazine interface. Let's be real, though. When it comes to the Note Pro 12.2, size clearly matters most. But that begs the question: Can you and your prosumptive tendencies handle it? 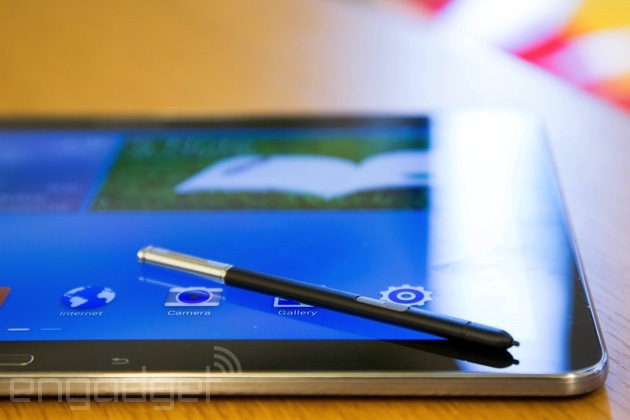 How would you rate the Galaxy Note Pro 12.2? I'll admit I was initially skeptical of Samsung's decision to counter complaints about its cheap-feeling, plastic design with -- wait for it -- cleverly disguised plastic. More specifically, I'm referring to that faux-leather back we first encountered on the Galaxy Note 3, which appears to be the new build standard for Samsung's flagship mobile products. It's something that sounds awful in writing, and seeing it in photos doesn't do it much more justice. And yet, my misgivings were unfounded. What I assumed would be a tacky design workaround is actually a sly coup on Samsung's part. Somehow, with that one change, Samsung's managed to make this 12.2-inch tablet look professional; a device befitting that "Pro" moniker. The black, textured matte back feels comfortable in-hand and looks like something you'd pull out of your attaché case. It elevates the Note Pro 12.2 to a premium perch other Note tablets fell short of -- a place where you could almost forgive its exorbitant price tag. Almost. As I've mentioned before, the Note Pro 12.2 could easily be mistaken for a stretched-out Note 10.1 2014 Edition. It bears an uncanny resemblance that extends even to the port layout. The dual-speaker setup occupies both edges of the device, high up enough that your hands won't muffle the sound. A redesigned, more stylish S Pen (denoted by its grooved, faux-metal cap) remains holstered in the upper-right edge of the device. Below that is where we find the only significant change. Whereas this spot used to house just a covered microSD slot, it now also houses a USB 3.0 port for fast data transfer and charging, though you can still connect via micro-USB if you like. Apart from that, you've got a 3.5mm headphone jack on the upper-left edge, plus power and volume up top alongside an IR blaster. The Note Pro 12.2's front face is similarly unchanged. Samsung's logo appears in the upper portion of the bezel, while the physical home button resides below and is flanked by soft keys for task management and navigating backward. Speaking of bezels, Samsung appears to have found a sweet spot size-wise that leaves just enough space for users' thumbs to rest without overtaking the edges of the screen. It's a decision made out of necessity, as well. At 295.6 x 203.9mm (11.6 x 8 inches), the Note Pro 12.2 is big enough that Samsung didn't have the luxury of adding to its dimensions. That said, at 750g (1.65 pounds) and 7.95mm (0.31 inch) thick, it's surprisingly light and thin -- two buzzwords that are practically a must for outsized mobile products. Different connectivity options mean different processors for the Note Pro 12.2 line and since this particular model is of the WiFi-only variety, it's imbued with an octa-core Exynos 5 SoC. The LTE model, on the other hand, will ship with a Snapdragon 800 chip inside. Regardless, both are paired with a healthy 3GB of RAM, and include radios for Bluetooth 4.0 and dual-band 802.11a/b/g/n/ac MIMO. Additionally, both come with either 32GB or 64GB of built-in storage. It's worth noting that, out of the box, only 25GB of the 32GB of storage on our unit was available for personal use. Thankfully, you can expand that capacity via microSD, so that internal storage constraint shouldn't cause much concern. There's also a massive, non-removable 9,500mAh battery to power that equally massive 12.2-inch, 2,560 x 1,600 display. For the Note Pro 12.2 and the Note 10.1 2014 Edition before it, Samsung used a TFT LCD, abandoning the hyper-saturated Super AMOLED panels that have always been a hallmark of Galaxy products. The trade-off here is a set of relatively muted colors that makes gazing upon the 12.2-inch panel more relaxing on the eyes. That 2,560 x 1,600 resolution also translates to a high pixel density of 247 ppi, which means greater detail in everything from icons to videos. There's not a visible pixel in sight, nor should there be. Viewing angles are fantastic, as well, but considering the size of the Note Pro 12.2, I don't expect you'll have much need to view it on a slant while you're lying in bed. Oh, and if you take this thing outside, I'd advise you to seek out shade -- even at full brightness, it was very difficult to make out the screen in direct sunlight. There's a good amount of third-party software pre-installed on the Galaxy Note Pro 12.2 -- about 27 apps, in total -- but thanks to some deft organization on Samsung's part, you don't really notice it. You need only access the app drawer for evidence of this tidy housekeeping. 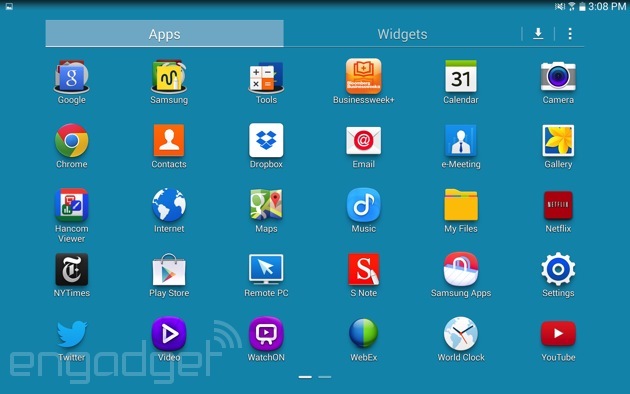 The first two icons displayed on the grid are dedicated folders for Google and Samsung apps. Although, in the latter case, there's a mix of non-Samsung-associated third-party apps included, like Evernote and Flipboard. Because of this streamlining, the Note Pro 12.2's app layout takes up just over two screens. Even the default home screen layout seems a bit cleared up: Only one row of apps and two widgets occupy the two default home screens. The Note Pro 12.2's bloat may seem like overkill on Samsung's part, but the vast majority of it is useful and includes common apps most users would have downloaded anyway. Things like Twitter, NYTimes, Evernote, Dropbox and Netflix, to name just a few examples. The same goes for productivity software like Hancom Viewer (for document viewing/editing), e-Meeting (a conference app) and Remote PC, which allows users to mirror and remotely control their PC or Mac. Samsung's Smart Screen eye-tracking features (i.e., Stay, Pause and Rotation) also make an appearance on the Note Pro 12.2, but they're disabled by default; you'll need to dive into the settings to turn them on. Of course, this being a Note, Samsung's also bundled in its requisite suite of S Pen apps. The usual gang's all here: Action Memo (a rebranded S Memo) for quick note-taking; Scrapbook, which collects articles, images or videos you highlight from the web; Sketchbook; and finally, S Note, which integrates directly with Evernote or Samsung accounts. In truth, this collection of apps serves more as a neat demo of what the S Pen can do, than as useful justifications for having the stylus. The S Pen's functionality hasn't changed from when we last saw it on the Note 10.1 2014 Edition. Removing it from its holster immediately triggers the onscreen Air Command display, a palette-like control for quick access to Action Memo, Scrapbooker, Screen Write, S Finder and Pen Window. You can also enable the Air Command display by depressing the S Pen's built-in button when hovering over the screen. Of the lot, only Pen Window and Scrapbooker require the user to draw onscreen to effect the desired action. For example, after selecting Scrapbooker, users will need to draw a circle around any items of interest to add to a personal collection. The same goes for Pen Window, which launches a pop-up application when a square is drawn onscreen. Swiping left from the bezel, either with the S Pen or your finger, will slide out an app panel for Multi Window shortcuts. To start filling the available four quadrants of the Note Pro 12.2's screen, you need only drag and drop the app of your choosing. These windows can be resized however you like, granting other onscreen apps more or less space, depending on your needs. On top of this, you can even select apps from the slide-out panel to appear as pop-up windows over your Multi Window selections. And in a neat UI flourish, Samsung's made it so that minimized pop-up windows appear as floating circles, not unlike Facebook's Chat Heads. Let's talk about Magazine UX, the Flipboard-like home screen/news feed that Samsung designed in collaboration with Flipboard for the Note Pro 12.2. It's nearly identical to Flipboard, but isn't officially Flipboard. And it's made all the more confusing by the fact that specific topic feeds (e.g., Science and Technology, Arts and Culture, Sports, etc.) 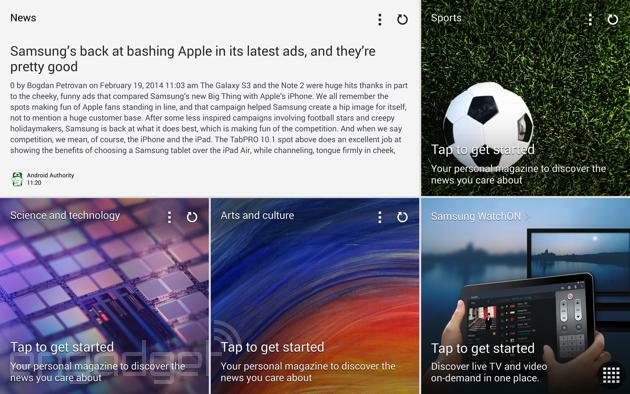 are not only navigated using the same page-flip animation, but also offer Flipboard as a curated news source. So, it is Flipboard... kinda. Whether or not you'll appreciate this addition to the Note Pro 12.2 depends on how much you use Flipboard to begin with. Don't despair if it's not your cup of tea, though. Unlike on the demo model we previewed at CES, Magazine UX is not set as the default home screen and is also not mapped to the physical home button. So you can effectively ignore it if you like, but be warned: There's no way to completely disable it. Perhaps the neatest feature Samsung's debuting here is Remote PC, which, as the name suggests, allows you to remotely access your PC or Mac. The setup process is fairly straightforward, and Samsung's step-by-step onscreen guide should take all of five minutes to complete. 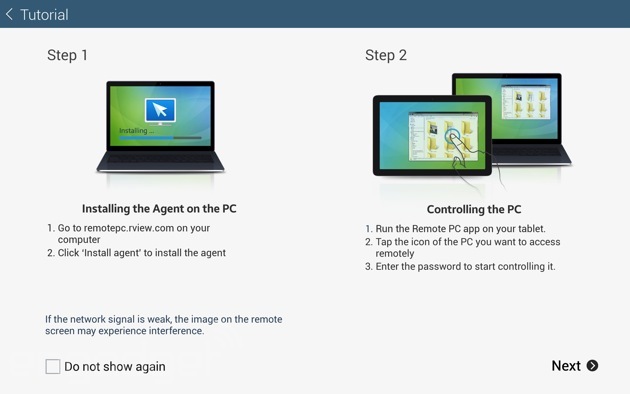 To get started, you'll need to download and install Samsung's dedicated remote access software to your computer, launch the corresponding app on the Note Pro 12.2 and enter an authentication key, which will appear on your PC's screen. After that, mirroring your PC on the Note Pro 12.2 is as easy as selecting your computer icon from within the app. Remote PC does give you full access to your PC, but it's not without its quirks. Navigation is split up between a mouse-and-pointer setup, accessible from a submenu, or the default gesture controls. While you'd think it'd be more natural to use the touch inputs for control, I found the traditional pointer control scheme to be more precise. There's also an understandable bit of lag between what's being mirrored on your Note Pro 12.2 and the computer. Depending on your wireless connection, though, your experience may vary. While Remote PC does have its advantages, there is one aspect of it users will find frustrating, and that's text input. As the Note Pro 12.2 is a tablet, its onscreen keyboard will take up a significant portion of the lower half of the screen -- the exact place where most dialog boxes for text entry would appear. The unfortunate result is that you can't actually see what you're typing, which made for some unintentionally amusing messages on my part. It's by no means a dealbreaker -- remote access to your PC is an incredible boon in and of itself -- but you do need to adapt to its quirks. When a reviewer forgets to notice a new product's performance shortcomings, you know it's a going to be a solid workhorse. And that's exactly the experience I had during my initial honeymoon phase with the Note Pro 12.2. Apps loaded quickly, and screen transitions were smooth and stutter-free. Everything worked as gracefully as I expected it to with an octa-core Exynos 5 chip and 3GB of RAM. That is, until I began pushing the Note Pro 12.2 to its moderate limits. I say "moderate" because I don't think enabling one instance of Multi Window on this device should cause it to significantly slow down. It's a performance hiccup that only grew worse with the addition of more windows. Yes, the Note Pro 12.2 is technically capable of displaying four open apps plus floating pop-ups on top of that, but there's no real benefit for the user. How could there be when the experience is marred by a noticeable lag? In fact, there's a pervasive slowness to the Note Pro 12.2 that ruins any sense of rapid-fire multitasking. It's the opposite of what the device's prosumer customer would want. As a media viewer, however, you can't really go wrong with the Note Pro's considerable screen size. That 12.2-inch screen's an ideal venue for showing off presentations and high-res photos. It's similarly fantastic for watching Netflix or any other streaming media, so long as you can find a comfortable way to position it. If you can find a suitable way to prop it up, the Note Pro 12.2 can even serve as a solid replacement for viewing media on your laptop. The dual speakers are powerful enough that you should be able to comfortably watch with chatty friends or even in a moderately noisy environment. As a bonus, there's also no distortion when the volume is pushed to the max. And now, back to that Exynos 5 chip. As noted earlier, this WiFi-only model comes equipped with 3GB of RAM and Samsung's octa-core processor inside; that of the big.LITTLE architecture. So you're not exactly getting all eight cores firing simultaneously, but a setup wherein the best-suited set of four cores, be it for light tasks or heavy processing, takes over. It's likely the reason the Note Pro 12.2 seems to take its time cycling through tasks when activity ramps up. From the table below, you can see that the Note Pro 12.2 stands up well in benchmark tests compared to its smaller sibling, the Note 10.1 2014 Edition, or the Tegra-4 powered HP SlateBook x2. And really, those are the only fair comparisons we can make as there aren't many other tablets that push past the 10-inch mark. What's curious is that, despite both Galaxy Note devices sharing the exact same processor and RAM allotment, the Note Pro 12.2 underperformed in two areas where it should've achieved parity. Then again, even the stronger benchmark results don't truly reflect our real-world experience with the Note Pro 12.2 and its tortoise-like pace. *SunSpider: Lower scores are better. Scores were run on Chrome using v0.9.1 for consistency. Note 10.1 scored 1,063 on v1.0.1. Nexus 10 scores were run on 10/1/13 using Android 4.3. The Note Pro 12.2's 9,500mAh battery is a significant bump over the 8,220mAh one used in the Note 10.1 2014 Edition. Which makes sense, since it needs more juice to power all the pixels on that 2,560 x 1,600 display. If you've ever taken a look at your power management tab in Android's settings, you know that the display is the biggest drain on battery life. Knowing that, you should temper your expectations for longevity. During a normal eight-hour workday, the Note Pro 12.2 lost just under 50 percent of its charge and that was with what I'd consider normal usage -- some light browsing, emailing and monitoring of my Twitter feed. I'm sure it'd retain that charge even longer, perhaps for two days, if power-saving were enabled and it was left to mostly idle under light use. Compared to the Note 10.1 2014 Edition, the Note Pro 12.2's formal battery result is a little more promising, but nowhere near impressive. With a locally stored video running on a loop, Twitter set to sync at 10 minutes and one push email account active, as well as WiFi and GPS enabled, the Note Pro 12.2 lasted 10 hours and four minutes. That's about two and a half hours longer than the Note 10.1 2014 Edition. It's an improvement, for sure, but as with any formalized test, it's not really reflective of actual consumer usage. Your personal consumption habits and dedication to power management will dictate just how long you can keep the Note Pro 12.2 powered up. Never before in my history of product reviews have I felt sillier than when I walked around Brooklyn taking photos and video with a 12.2-inch tablet. People stared. I could feel them judging me, and rightly so. Not only does it feel ridiculous to take photos with the Note Pro 12.2's 8-megapixel rear camera, but it's also really difficult. As I mentioned earlier, it's hard to see the screen in bright sunlight, so oftentimes I wasn't fully aware of how my shot was framed or if it was in focus. Then there's the simple matter of maneuvering the Note Pro 12.2 so you can access the camera settings menu or scroll through the mode-select wheel. It'll make you feel clumsy and corny, and don't you have a smartphone for this purpose anyway? The Note Pro 12.2 snaps photos at a resolution of up to 3,264 x 1,836 in 16:9 ratio or 3,264 x 2,448 for 4:3 shots. Samsung's included menu options for burst mode and image stabilization -- both of which are disabled by default -- as well as the ability to customize the volume key function for video, photos or zoom. That mode scroll I mentioned before offers up the same suite of settings we saw debut on the Galaxy S4: Beauty face, Best face, Sound and Shot, Drama, Eraser, et cetera. During my neighborhood walkabout, I stuck to Auto mode as that's what most consumers will probably resort to, anyway. 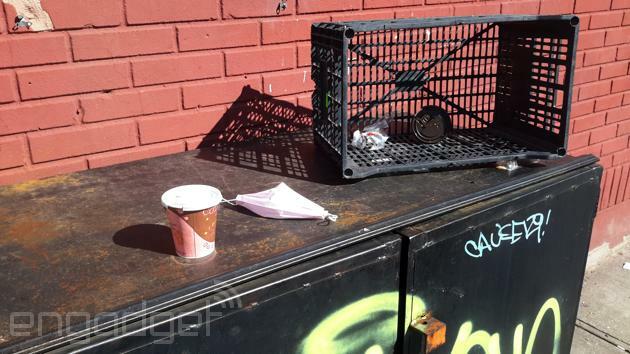 I don't have any real complaints about the Note Pro 12.2's photo-imaging performance, nor do I have any raves. My final batch of shots was above average. Color reproduction was fairly accurate, although shots with a greater depth of field tended to appear less finely detailed. My sample 1080p video, however, is unwatchable, even with image stabilization enabled. As you'll see below, the Note Pro 12.2 records ambient audio clearly, but utterly fails to maintain a smooth frame rate when the camera or objects are in motion. First things first: When it comes to the Note Pro 12.2, you need to decide how much internal storage you require. If you do go down the higher-end route, then you'll be paying a $100 premium for 64GB of storage, totaling $850. Keep in mind that there is a microSD slot, so you can cheaply augment that storage with up to a 64GB card. In comparison, the 32GB Note 10.1 2014 edition, whose screen is 2.1 inches smaller and bears the same S Pen, Exynos 5 processor, screen resolution and functionality, can be had for $600. That's a steep discount of $150 for what is essentially an identical tablet made by the same company. 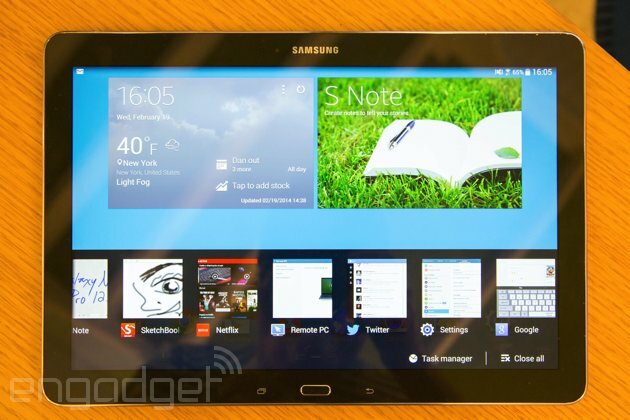 You don't need to narrow your choices down to just Samsung's Galaxy Note line for a high-res Android tablet. There are alternatives like Google's Nexus 10, which gets you stock Android, a 2,560 x 1,600 resolution and 32GB of storage for $500. Or you can explore something like HP's Tegra-4 powered SlateBook x2, a 10-inch full HD convertible tablet that comes with a keyboard dock for $480. Although, take note, the SlateBook x2 is only offered with 16GB of internal storage. When it comes to iOS options, the 9.7-inch, WiFi-only iPad Air looks like a relative steal next to the Note Pro 12.2. For $600, you're getting a marginally lower resolution (2,048 x 1,536), 32GB of non-expandable storage and access to Apple's ecosystem. A $100 price bump gets you all that and a roomier 64GB of internal storage. Then again, it doesn't have active digitizer pen input, so there's that. All told, the iPad Air is still the more expensive option compared to the kitted-out Note 10.1 2014 Edition, but it offers a reliable user experience. That's something neither the Note Pro 12.2 nor Note 10.1 2014 Edition can guarantee. To me, the Galaxy Note Pro 12.2 is quintessential Samsung. It's emblematic of that spaghetti-to-the-wall approach we've seen the company indulge in time and again. I don't know that the Note Pro 12.2 needs to exist because I don't know that there's actually a niche hungry enough for this product. With its same-y internals and feature load, the Note Pro 12.2 seems more like an endorsement of the cheaper and smaller Note 10.1 2014 Edition. Forget the Flipboard-ish Magazine UX and Remote PC functionality -- its only two standout features. Everything the Note Pro 12.2 can do, the Note 10.1 can do just as well, or even better if we're taking benchmarks into consideration. Then there's that price. An MSRP of $750 or $850 is hard to swallow considering you're mainly getting two more inches of screen space and a performance that tends toward a more leisurely pace. The Note Pro 12.2 is also too big to hold comfortably. Yes, it's a great go-to for media consumption, but you either have to prepare for wrist fatigue or MacGyver a rig to prop it up independently. It's just not worth the trouble. Prosumer or not, there are better, more cost-effective ways to do what the Note Pro 12.2 aspires to do.